The original, non-musical film version of the book which inspired "Fiddler on the Roof". I noticed this on TV after it started, so I missed the beginning. However, what I saw, which was most of it, moved me greatly. I grew up in a home where Yiddish was used by my parents when they didn't want the kids to understand. Russian was used when they really didn't want us to understand! 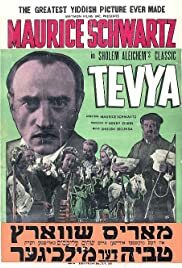 Unfortunately my Yiddish is not up to fully understanding the dialogue of the movie, though a meaningful percentage did come through. The titles were OK, and sometimes inadequate. To compare this to Fiddler is impossible. This is a tragedy and Fiddler is a musical. The acting is very good. It is old-fashioned acting, with large emotions and gesture. The Yiddish, that which I could understand, is a very nice Yiddish. No Americanisms in it, as the Yiddish I heard at home. One thing that was disturbing was the stereotypical portrayal of the non-Jewish characters. They were portrayed as coarse and mean-spirited. Of course, in a steytl in 19th century Russia, that was probably the norm. I recommend this film to all. To those who grew up in an immigrant Jewish household, it is a must.